Now, I’m not saying that food is the only consideration when choosing a destination to visit… but for me, it’s definitely up there with the beautiful beaches and buzzing cities as one of the main highlights of any adventure. This week we’re exploring some delicious national dishes of Asia… now excuse me while I nip off to the nearest food cart. Bi Bim Bap, South Korea. The archetypal Korean dish perfect for lunch or a light dinner, Bi Bim Bap is best enjoyed in the traditional hot stone bowl (dolsot). Rice, veg are added along with a variety of other ingredients which often include raw beef and egg that are cooked in the heat of the bowl. Try it with Kimchi (spiced fermented cabbage) and hot red pepper paste for the true authentic experience. The direct translation is fried rice…but Nasi Goreng is so much more than that! Often served with loads of accompaniments including shrimp crackers, pickles, sweet peanuts, dried anchovies, sweet soy sauce, chili sauce and a fried egg – a well-made Nasi Gorang is mouthful after mouthful of taste explosions! From a country that famously has no problem eating anything that moves (including tarantulas, insects and snakes – oh my!) 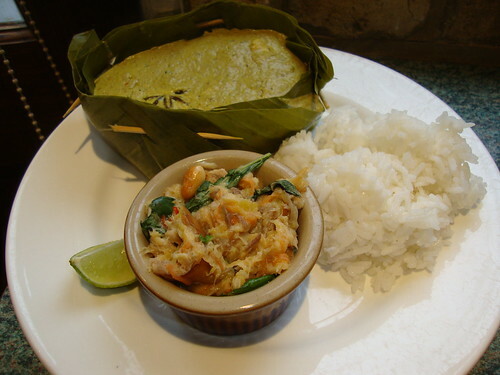 curried fish with coconut milk steamed in a banana leaf sounds positively tame. While it may not be a deep fried creepy crawly it is delicious and, at around $1 a serving on the street, it’s cheap enough to enjoy every day. Amok Trey. Image courtesy of Hazza2410 on Flickr. Fancy something sweet to cut through all that spice? Halo Halo is a traditional desert from the Philippines which is made from shaved ice mixed with evaporated milk and covered with…pretty much whatever you like! Jack fruit and red beans are common as well as some kind of jelly, puffed/dried rice and anything brightly coloured and sweet. Might not sound too amazing in the depths of winter – but it’s one hell of a hot summer cooler. 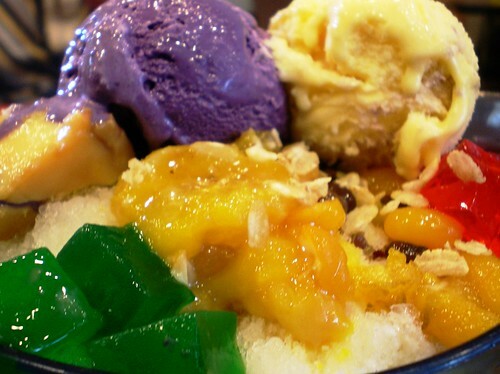 Halo-Halo. Image courtesy of AJ Matela on Flickr. A noodle soup with a difference, Mohinga is a Burmese breakfast food which can be found all over the country. The main ingredients are white fish and rice noodles cooked in fish stock and flavoured with turmeric. Join the locals and get yours from one of the many carts that line the streets early in the morning for the best start to your Burmese day. If we’ve got your tummy rumbling for some Asian grub and your feet itching for adventure, check out our cheap flights and our huge election of adventure tours and experience an authentic taste of Asia for yourself.